During Hollywood's Golden Age, 20th Century-Fox possessed only a fraction of the musical talent employed by rival MGM, but the studio's premier singing star�Alice Faye�easily held her own against such formidable Metro adversaries as Judy Garland and Lena Horne. With her rich, mellifluous alto, blonde locks, and slightly zaftig figure, Faye defined Fox musicals for more than a decade, and rarely was shown to better advantage than in Alexander's Ragtime Band. Using the timeless Irving Berlin standard as a springboard, this nostalgic, tuneful love story chronicles the evolution of American music from its ragtime roots to full-blown swing. Faye stars as Stella Kirby, a brassy, rough-around-the-edges saloon singer who reluctantly teams with novice bandleader Roger Grant (Tyrone Power) after their impromptu rendition of�you guessed it�Alexander's Ragtime Band enthralls a throng of revelers in 1915 San Francisco. Capitalizing on their overnight success, Roger changes his name to Alexander and takes his ragtime band�which includes pianist Charlie Dwyer (Don Ameche) and drummer Davey Lane (a pre-Wizard of Oz Jack Haley)�on tour. He refines Stella against her will, yet soon their oil-and-water personalities predictably mesh and romance blooms, much to the chagrin of Charlie, who not-so-silently pines for her, too. All goes swimmingly until a Broadway producer offers Stella a show. She leaves the band�and Roger�and becomes the toast of New York. Meanwhile, bitterness eats away at Roger, who hires snappy singer Gerry Allen (a young and boisterous Ethel Merman) to replace Stella. Gerry gets stuck on Roger, who still carries a torch for Stella, who, in turn, marries Charlie on the rebound. World War I intervenes and further complicates matters, before true love conquers all. While the plot of Alexander's Ragtime Band is more substantive and dramatic than most musicals of the period, it still receives short shrift. We learn on the film's commentary track that only a paltry 40 of the film's 106 minutes are devoted to drama�not enough to sufficiently develop the complex relationships or keep the story from feeling rushed and abbreviated. Power is a very fine actor, but spends most of the film wanly waving his conductor's baton, especially during Alexander's final third, which amounts to little more than a marathon musical montage. The numbers are entertaining (and show off Merman to terrific advantage), but the length of the sequence severs the film's emotional thread. Fans of Irving Berlin's music, however, will delight in hearing more than a dozen of the composer's best-loved songs, including such classics as Heat Wave, Easter Parade, and Oh, How I Hate to Get Up in the Morning, and the beautiful ballads All Alone, What'll I Do?, and Now It Can Be Told. Faye and Merman sell each tune with plenty of soulful energy, and even the personable Ameche raises his surprisingly pleasant voice on a couple of occasions. Fox spared little expense on the production numbers, which look glitzy and lush, even in black-and-white. 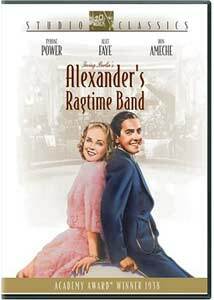 Alexander's Ragtime Band received six Academy Award nominations in 1938, including Best Picture, and though MGM's glossy Technicolor musicals now overshadow this antique, it remains a rousing and touching period piece. A few less songs and a bit more drama, and this classic musical would be just about perfect. Image Transfer Review: The black-and-white transfer sports excellent contrast and a wide gray scale. Inky, rich blacks stay solid and well defined, while light grain adds warmth and texture to the image. Occasional speckling and some annoying white vertical lines intrude now and then, but on the whole, the print remains clean and meets Fox's high Studio Classics standards. Audio Transfer Review: Both stereo and mono tracks are included, and provide clear, vibrant sound. Almost all surface defects have been removed, and distortion is utterly absent, even during the most rafter-raising musical numbers. Tonal depth and fidelity are also quite good, especially for a film of this vintage. Extras Review: Fox pads the disc with especially interesting supplements, beginning with a thorough audio commentary by film score restorer Ray Fiola, who also produced the original soundtrack CD of Alexander's Ragtime Band. Fiola sounds a lot like Rudy Behlmer, and presents his information in the same meticulous and engaging fashion. Nary a bit player escapes his notice, and he peppers his comments with plenty of obscure (but usually relevant) details. According to Fiola, Alexander's was originally intended to be an Irving Berlin biopic, but early on the composer nixed the idea, preferring to tell the tale of music's evolution rather than his own. Fiola, however, effectively weaves a personal and professional biography of Berlin into his insightful remarks about the film, and that topic alone makes this commentary well worth one's time. Next up are three deleted musical numbers�quite a rare find, considering the film's advanced age. Don Ameche offers a lilting rendition of Some Sunny Day, Jack Haley croons and clowns his way through In My Harem, and Ethel Merman belts out Marching Along With Time with her customary power and verve. With so many tunes already cluttering the film's soundtrack, it's easy to see why these songs were cut, but thankfully they've been well preserved, and it's a treat to see them here. Alice Faye: The Star Next Door, an episode of A&E's popular Biography series, profiles the singer/actress through film clips, photos, and interviews with Roddy McDowell, Hugh Hefner, Jane Withers, Pat Boone, and Faye's daughter Phyllis Harris, among others. The 45-minute documentary, narrated by Peter Graves, touches on Faye's early years, her marriages to Tony Martin and Phil Harris, and premature retirement from films. Because Faye's life was far less dramatic than the Hollywood norm, this profile tends to drag, but it's nevertheless worthwhile, and shines a deserving spotlight on one of the movies' most beloved and underrated stars. A rare installment of British Movietone News (running five minutes) chronicles the London premiere of Alexander's Ragtime Band, and contains interviews with Irving Berlin, George Sanders, and several British stars of stage and screen. A hefty still gallery follows, featuring 31 black-and-white images, including behind-the-scenes production shots, candids, sketches, and studio portraits. Finally, a lengthy (but entertaining) trailer begins with shots from the film's star-studded press preview, featuring appearances by such luminaries as Claudette Colbert, Norma Shearer, Jack Benny, Constance Bennett, Janet Gaynor, Cesar Romero, Deanna Durbin, Eddie Cantor, John Barrymore, Irene Dunne, Merle Oberon, James Stewart, Paul Muni, Alice Faye, Don Ameche, Tyrone Power, Darryl F. Zanuck, and Irving Berlin. Standard excerpts from the film follow, along with plenty of studio hyperbole. The charm and talent of Faye, Power, and Ameche, coupled with a cavalcade of Irving Berlin standards and impeccable production values, make Alexander's Ragtime Band one of Fox's finest musicals. A solid transfer, clean audio, and marvelous extras enhance the disc, which will please both musical fans and classic film buffs alike.